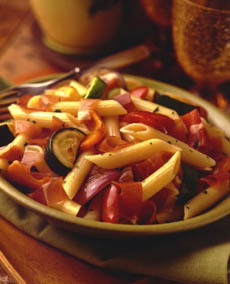 One of the most popular pasta cuts, penne rigate. The tubes are ridged (rigate) to help the sauce adhere. Photo courtesy of ParmaHam.com. Get the recipe. This is Page 10 of a 10-page pasta glossary, including terms such as whole grain pasta and whole wheat pasta. If you enjoy this Pasta Glossary, we have a food glossary for almost every category of food. Check out your favorites! Click on a letter to go to the appropriate glossary section. This glossary is protected by copyright and cannot be reproduced in whole or part. You are welcome to link to it. Udon are thick, wheat-based Japanese noodles. They differ from ramen, the thin Japanese noodles, in their width; but both are served in a variety of preparations. Both were brought to Japan by Buddhists priests returning from voyages to China (as was tea). 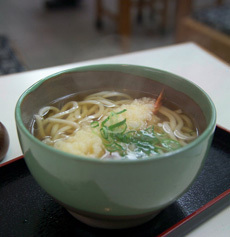 Udon noodles are generally served in chilled dishes in the summer and in hot dishes like soup in the winter. Tempura udon. Photo by FG2 | Wikimedia. 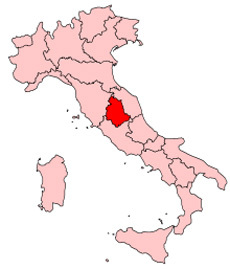 A hilly region in central Italy, bordered by Tuscany to the west, the Marche to the east and Lazio to the south. The capital is Perugia. Specially cut pasta, short wide ribbons with a ruffled edge (vehn-TAHL-yee). A round pasta slightly thinner than spaghetti but thicker than angel hair, vermicelli means “little worms,” from the Latin “verme,” worms. 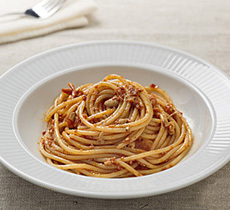 As versatile as spaghetti but not as hearty, for those who prefer less of a “mouthful,” it works with the same sauces (tomato, broth-based, lighter cream sauces), except for super-thick sauces. Like spaghetti, it is also broken and cooked in soups (vair-mee-CHELL-lee). Vermicelli with red pesto. Get the recipe. Photo courtesy Barilla. Whole grain pastas are available in brown rice, kamut, quinoa, soba (buckwheat), and spelt, whole wheat (see below). Read our article on whole grain cereals for more information on whole grains. Many short and long pastas are made with whole wheat semolina, which provides valuable extra fiber and nutrients as well as a distinctive nutty flavor. In Italy, flour is classified either as 1, 0, or 00. This scale refers to how finely ground the flour is and how much of the bran and germ have been removed. Double zero or doppio zero (DOE-pee-yo TSAY-roe) is the most highly refined—the consistency of talcum powder. Since semolina, the hardest and most suitable flour for pasta, requires professional-strength kneading machines, 00 flour is the best for making pasta at home. It will stand up in cooking better than pasta made with all-purpose or other flours. The flour made by Antico Molino Caputo in Italy, is considered to be the world’s best 00 flour for pizza and breadsticks. It is available at upscale Italian markets and online. A popular shape, ziti (zee-tee) are a medium-sized, long, thin tubular pasta. The tubes are often ridged. The word is Italian vernacular for “bridegrooms,” and in Campania and Sicily, baked ziti is traditionally served at wedding banquets. Large ziti are called zitoni (zee-TOE-nee). 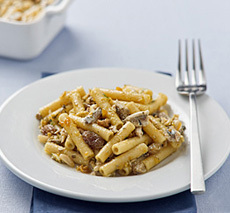 Ziti with sardines. Get the recipe. Photo courtesy Barilla.